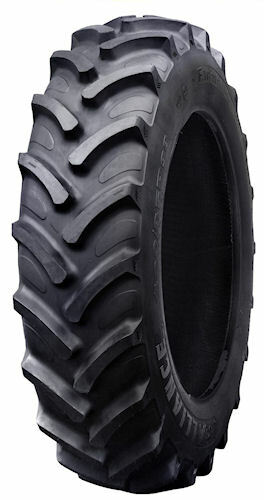 Alliance FarmPro R1W radials offer farmers more than a dozen sizes in deep-thread radial tires. Alliance Tire Americas is introducing its new Alliance farmPRO R1W Radial Tractor tire line in more than a dozen popular sizes to offer North American farmers a new choice – a deep-tread radial that combines performance and value for utility tractors. "The Alliance FarmPRO R1W radial tire line delivers the performance of at a competitive price," says James Tuschner, director of marketing for Alliance Tire Americas in Brentwood, Tenn. "It's the perfect choice for utility tractors that can reap the benefits of radial technology." Alliance FarmPro R1W radial tractor tires feature a stubble-resistant compound and an average tread depth 20% deeper than standard R1 tractor tires. It is ideal for utility tractors that can reap the benefits of radial technology. The Alliance FarmPRO R1W tractor radial tires feature a stubble-resistant compound and an average tread depth 20% deeper than standard R1 tractor tires. In addition to improved traction, the Alliance FarmPRO radials deliver significantly better fuel economy than standard bias-ply R1s. The Alliance FarmPRO line is priced lower than the company's Agri-Traction brand R1W radials, which remain a globally popular choice for high load/high speed applications. "The Alliance FarmPRO line is competitively priced to help farmers get the best performance on their utility tractors in terms of traction and fuel savings – which is important with escalating fuel prices – as well as cost," says Tuschner. "We have been eager to give farmers more choices in the radial options on the market, and the Alliance FarmPRO delivers!" The Alliance FarmPRO line is currently available in the following sizes: 280/85R24, 340/85R24, 380/85R24, 320/85R28, 340/85R28, 380/85R28, 420/85R28, 420/85R30, 460/85R30, 420/85R34, 460/85R34, 420/85R38, 460/85R38 and 520/85R38. Additional sizes, including tires for 42- and 46-inch rims, will be released soon, says Tuschner. The FarmPRO line will be available throughout the U.S. and Canada through Alliance Tire dealers and distributors. Learn more at your Alliance Tire dealer or visit www.alliancefarmpro.com or www.agtire.com.